What do a supermarket, one of the world’s biggest blogs and a Victorian entrepreneur have in common? If you’re trying to sell anything, they should have it in common with you, too. To work it out, think: what did it mean to be a Victorian entrepreneur? The thing is, life was hard for the Victorian gent. Officer commissions were no longer available for purchase, meaning the gentleman soldier may have to share the mess with the lower classes. Proper dress insisted on waistcoats even in summer. And a man was required to tip his hat to ladies he passed in the street, even if his hands were already full of parcels from Liberty’s. Into this mess of filth and desperation stepped James Boyle. A man with a vision. A man with the drive to make life better. 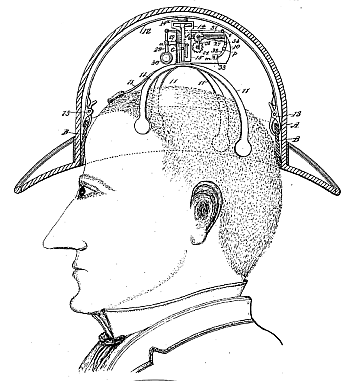 A man with a patent for a self-tipping hat. It seems ridiculous now. It seemed a bit ridiculous then. James’s device sat underneath the hat and clamped to the head with four short metal legs. A nod of the head would activate the clockwork mechanism, which politely tipped the hat, and returning your head upright set it back into the starting position. Ladies could be suitably greeted, and social etiquette restored, without ever needing to suffer the inconvenience of putting down your parcels or raising your hand. You may mock, but you shouldn’t. James had every reason to think he was on to a good thing. His invention was based on the same premise as some of the most successful in history, from the wheel to the car to the computer. The premise that people are lazy, and if you can make life easy for them, you’re on to a winner. There’s very few absolutes in the world, especially in advertising. But this is one of them. Everyone, everywhere, wants an easier life. If your ads can show that your product or your company makes life easier for your prospect, you’re going to sell more. Lifehacker have built a huge following for their blog devoted to getting more done easier. Tim Ferriss has made his name with his 4-Hour series of books. Work weeks, bodies, cooking… Tim will promise to help you master or achieve all of them in four hour stints. And what does that imply? That it’s going to be easy. This is crucial. Tim’s first book was the 4 Hour Work Week, now something of a touchstone text for anyone wanting to quit the rat-race and make a living online. But unlike most bibles for internet living, Tim never once promised to make anyone rich. In fact, he promised the opposite – a business that would meet your daily needs and make a reasonably consistent five-figure-per-year income. Hardly Warren Buffet. But he promised you’d be able to achieve it easily, and that’s what attracted people. So how do we make our products seem like they’ll be easy to use? You might think that you should look at the advertising for one of the countless labour-saving devices for best practice here. Lidl are developing a bit of a track record in on-topic, well-aimed advertising. 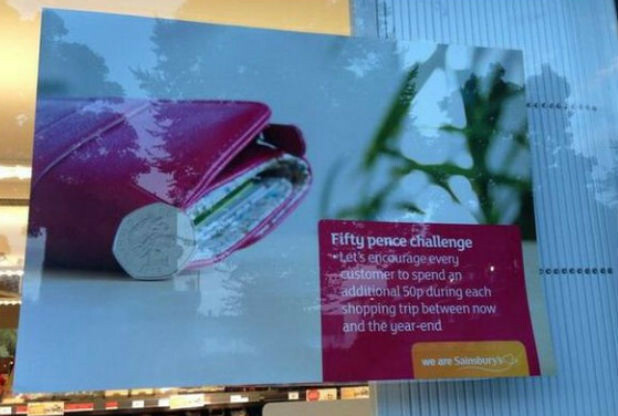 Just over a week ago, Sainsbury’s had one of those minor mess-ups that no-one ever cared about before Twitter existed, when someone put up a poster meant for staff motivation in a shop window. Now, it should come as much of a shock that supermarkets are attempting to make you spend money. If it does, then I suggest you’re possibly not quite ready for this level of retail shopping. But of course someone took a photo, and the photo got 5000 retweets, and Sainsbury’s were suitably embarrassed. 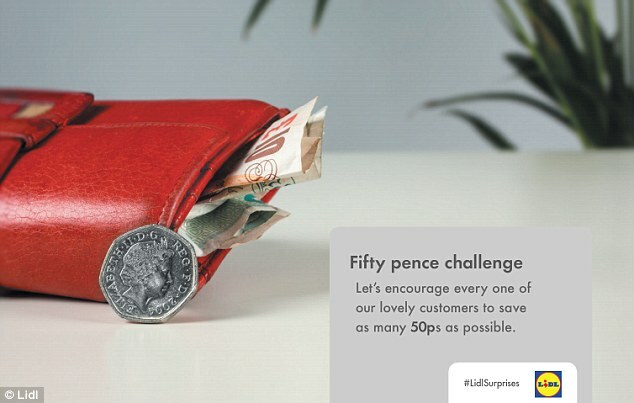 This is Britain, and everyone loves it when companies take snarky digs at each other. So naturally, this got a load of retweets too. 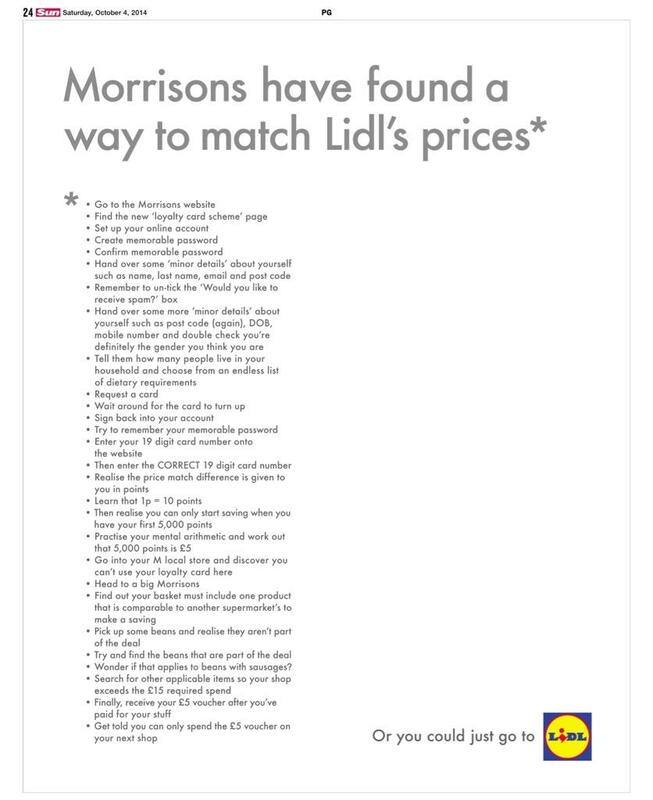 Tons of free exposure for Lidl, and they never even mentioned Sainsbury’s in the ad. Now, they’re at it again. Morrison’s recently launched a loyalty card in an attempt to claw back a bit of market share. The USP was that this loyalty card came with a price-match guarantee – if you could find the same product cheaper anywhere else, Morrison’s would give you points to make up the difference. And this wasn’t just matched against equivalent-tier supermarkets – Morrison’s also guarantee their prices against the budget supermarkets, Aldi and Lidl. This is how you demonstrate that you are the easier option. Put you and them in direct comparison. Remove all requirements for your prospect to think. Explain their process in mind-numbing detail and explain yours in a sentence or less. Make it obvious – completely black and white. This is all it takes. Providing people with two options, and presenting yours in a way that makes it seem better. You don’t have to claim it’s the easiest solution on the market. You just have to show that it’s easier than whatever you’re comparing it to. Emphasising ease alone isn’t necessarily going to make your product sell. James Boyle’s hat never got anywhere, possibly because fitting it into your favourite topper seemed like more work than just tipping your hat manually. But as Tim Ferriss, Lifehacker and Lidl will attest, it’ll get you a long way.